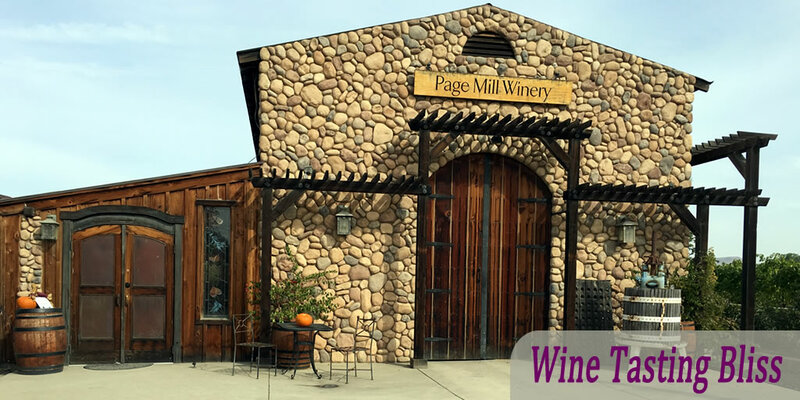 Page Mill Winery is a great choice if you’re visiting the Livermore Valley or playing tour guide for out-of-town friends. They encapsulate the best aspects of tasting in a small working winery: scenery, architecture, staff, and of course, amazing wine. 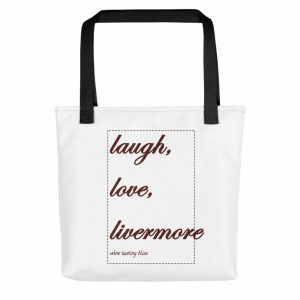 Only have time to visit one winery? Why not give Page Mill a try! 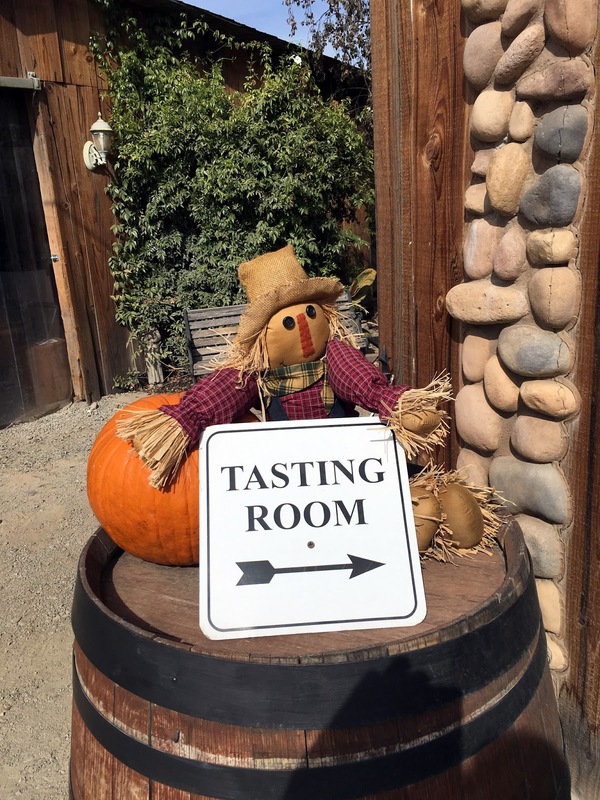 It was a gorgeous, quiet autumn Saturday and we had a little time to taste some wine. 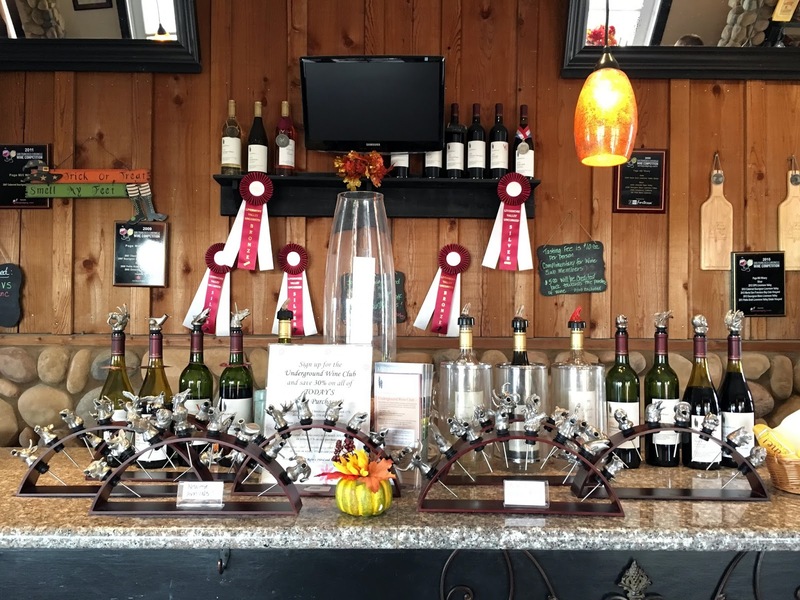 Once we realized how long it had been since our last visit, we decided to swing by Page Mill Winery and find out what’s new. A beautiful day deserved a beautiful winery. Harvest was barely over, so the grape vines we passed as we found a parking spot were still holding some berries, with the leaves showing just a blush of yellow and red. We were surprised by how few cars were in the lot, allowing us to get a spot right up by the tasting room. Good parking karma is always a great way to start a tasting! 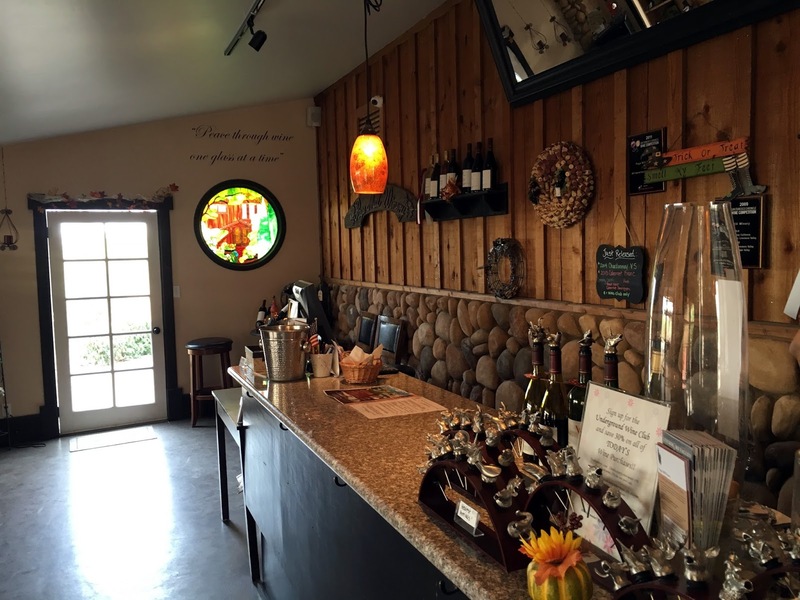 We entered the tasting room and were immediately welcomed by wine guide Debby. We strategically chose our space along the bar (close to the sale items with an inspiring view of the row of tasting bottles). We settled in and got ready to taste. The Page Mill white wines are consistently crisp, with their Chardonnay a consistent hit with our group. The 2014 Angela’s Cuvee won top honors from us in the white category. Named after the winemaker’s wife, this sparkling grenache blend was light and not too sweet. Perfect for a celebratory event. As we were tasting through the list, we looked around the tasting room. 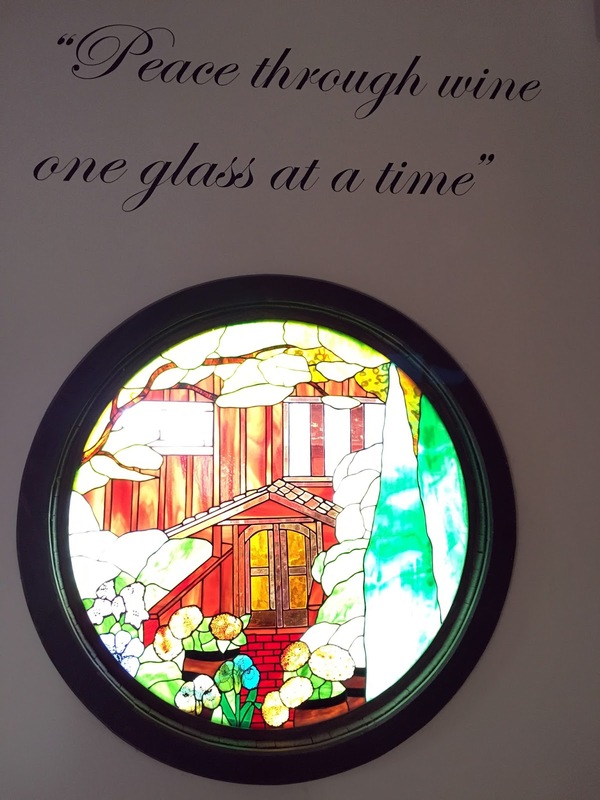 We learned that the stained glass on one wall showed the original winery in Palo Alto (on Page Mill Road, get it?). The tasting room doors are also from the original facility. We moved to the reds, discovering their 2012 Zinfandel. Wow! Forest notes on the nose and raspberry and bright cherries on the tongue. 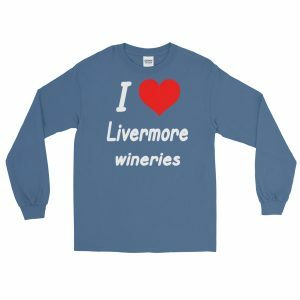 Less alcohol than a typical Zin and a much lighter flavor. One of these followed us home. 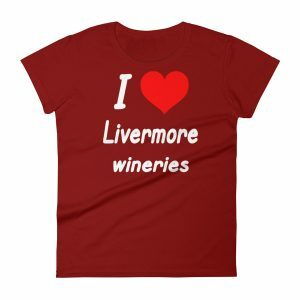 Another favorite of our was their 2012 Estate Petite Sirah. Nice plum notes with a clean, somewhat acidic finish. We’d lay this down for a couple of years, a which point we think it will be amazing. We completed our tasting, purchased some wine and an intriguing etched wine bottle with internal light to help us celebrate Halloween. We narrowly avoided buying some pewter gargoyle wine pourers, resorting to that old “we need to get to our final winery before it closes” dodge. With laden arms but happy spirits, we wished Debby and the rest of the tasting room staff well and set of on our next adventure. Have you visited Page Mill? Click to give'em a tweet of support!